One sunny fall day our family hiked up a Cascades mountain trail, stopping to play on rock slabs by a stream. It was a popular place, full of scrambling, sliding kids. As the late afternoon sun slanted through the trees, we noticed two tawny-orange anglewing butterflies flitting around a side pool and repeatedly landing on rocks. I'd been hiking ahead on the trail and was sweaty. I decided to indulge in a little showmanship. Slowly extending my hand to one of the anglewings, I watched as the butterfly climbed aboard and began to probe my skin with its proboscis. Did that tickle! I walked around for several minutes, gaining oohs and ahs from other hikers. The anglewing never left my hand. With my ten-power hand lens, we looked at its compound eye, its colorful wing scales and hairy body. What seemed like magic to the other hikers was based on a simple bit of information: most anglewings aren't exclusively interested in flower nectar. Since they overwinter as adults, they need extra nourishment. Tree sap and decaying fruit are rich in amino acids; carrion, dung, dirt and sweat contain salt and other minerals. I wasn't surprised to see anglewings at a streamside clearing in the forest, since it's their preferred habitat. Males perch on a branch at clearing's edge and watch for passing females, while chasing away intruders. They can quickly fly back into the trees for safety from predators. Anglewings also frequent a park ravine in my neighborhood. Occasionally one flies through my city yard. If you live in the suburbs or near a greenbelt, your chances of seeing them at garden's edge may be even better. If you're willing to raise a patch of nettles (Urtica dioica), you're very likely to catch the attention of egg-laying females. Despite incorrect references to heavenly "angelwings" in some recent books and articles, anglewings are named for wing shape (the genus Polygonia means many angles). "Punctuation" anglewings include Comma (Polygonia comma) and Question Mark (P. interrogationis), both named for the tiny silver marking on hind wings' ventral surface (underside). These butterflies, native to the eastern half of the U.S., are colored in burnt orange with dark brown blotches. Resting against tree bark with wings closed, they're virtually impossible to see. Ragged wing edges and cryptic brown/gray coloration on the underside make them look like a dead leaf or bark. The Comma lays pale green eggs (sometimes stacked like pancakes) on leaves of elm (Ulmus spp. ), nettles and hops (Humulus lupulus). It's been known as the hop merchant because growers believed you could predict market prices by the appearance of the butterfly's chrysalis. Gold markings on the irregular, brown chrysalis meant a good year, silver a poor one. The Question Mark had another name in the previous century, too. It was called the violet tip, for the lustrous coloring at wing's edge. In Butterfly Gardening for the South (Taylor Publishing, 1990), Geyata Ajilvsgi paints an intriguing image of the Question Mark as a creature likely to become intoxicated from rotting fruit, then lying almost flat on its back while basking on the ground (to expose the camouflaged ventral wing surface). Jeffrey Glassberg (Butterflies Through Binoculars, Oxford University Press, 1993) distinguishes the Question Mark from the Comma by its larger size and more robust flight, with slower wingbeats. He says the butterflies move down the East Coast in late fall in a "dramatic migration," then return as scattered individuals in spring. Some may overwinter if weather is mild. Females lay eggs on leaves of elm, hackberry (Celtis spp. ), hops, nettle and false nettle (Boehmeria cylindrica). Anglewings commonly seen in my Northwest woods bear more fanciful names like Satyr and Zephyr. Nymphs, too, are commemorated in the family name Nymphalidae (a large group of brush-footed butterflies, whose two front legs are short and brush-like). Like the mythological creatures for which they're named, these anglewings cavort in woodland glades. The Satyr Anglewing (P. satyrus) frequents my nearby park, as well as the foothills and canyons of western states and the lower half of Canada. Its wings are golden with dark blotches and variegated brown/gray with a hooked silver comma underneath. Larvae feed on nettles and may make a leaf shelter for safety. Common higher in the western mountains, the Zephyr Anglewing (P. zephyrus) is golden to orange in coloration, with dark markings. 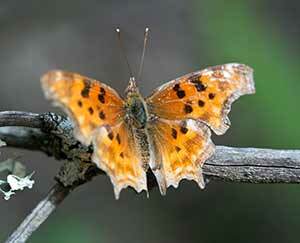 The silver comma on underside is not hooked. It darts rapidly in and out of trees. Unlike other anglewings, it enthusiastically takes nectar from flowers like aster and rabbitbrush (Chrysothamnus nauseosis). Larvae feed on currant (Ribes spp. ), elm and rhododendron. Anglewings hibernate as adults during winter. Some simple additions to your yard may lure them to overwinter, even to mate and reproduce there in the spring. A woodpile, structure with loose boards, or tree bark can provide safe, relatively dry spaces for hibernating butterflies. Theoretically a candidate for a hibernation box (see article, fall 1997 BGQ), an anglewing might also use a coffee can half-full of dead leaves. Make sure such enclosures are out of direct sun. In early spring, sunny weather brings anglewings out of hibernation. They'll be attracted to sweet sap of trees like maple, birch or willow; break off a twig to make sap flow. Providing larval plants, though, is the key to successful butterfly gardening. For anglewings, you may get lucky with a trellis of hop vines. Then again, you may want to cultivate a patch of stinging nettles. L. Hugh Newman, who advised Winston Churchill on butterfly gardening at Chartwell, makes a convincing case for nettle growing in Create a Butterfly Garden (London: Country Book Club, 1968). He points out that larvae of anglewings, tortoiseshells* and the Red Admiral all feed on nettles. Imagine a garden full of these beautiful insects! Newman often found nettles growing in disturbed areas where a hole or natural depression kept wind at bay. He suggests planting them in a sunny, sheltered spot near the shed or woodpile where butterflies may have overwintered. An ideal setting would also include a pond or seep where butterflies can "puddle" (sip mineral-rich moisture from dirt). Keep the roots contained and deadhead blossoms so neighbors won't receive a bounty of nettle seedlings. Cut nettles back in early summer to provide fresh growth for a second brood of larvae (inspect for larvae before throwing on the compost). And don't forget to brew up some nettle soup as a spring tonic for yourself--it's very nutritious! *In North America, the Milbert's Tortoiseshell (Nymphalis milberti) feeds on nettles; the California Tortoiseshell (N. californica) feeds on ceanothus. Article by Claire Hagen Dole, Publisher/editor of Butterfly Gardeners' Quarterly. #15, winter 1997-98.